Ensalada de Pollo, or Mexican Chicken Salad, is a Mexican recipe that’s a party favorite – a fiesta for your mouth and your guests as well. 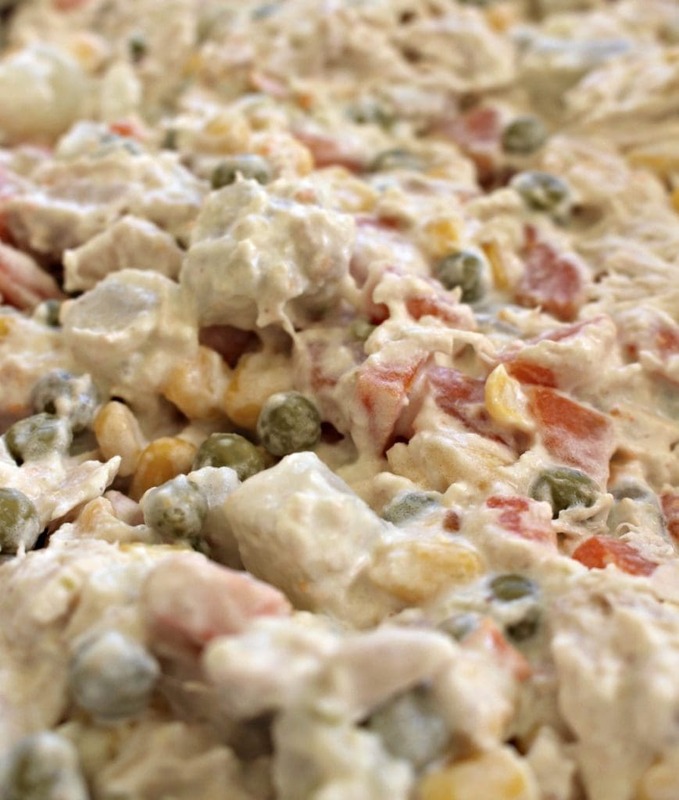 It consists of chicken and vegetables dressed in a creamy mayonnaise dressing. 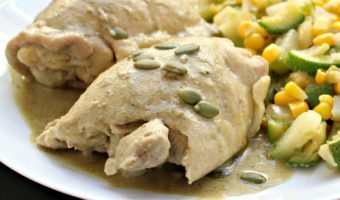 Ensalada de Pollo is a Mexican recipe that’s a party favorite – a fiesta for your mouth and your guests as well. 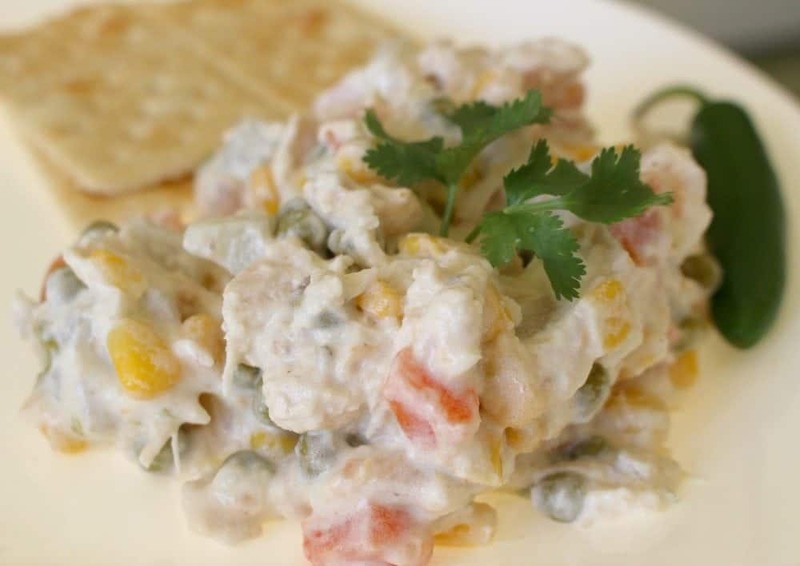 It consists of chicken and vegetables dressed in a creamy mayonnaise dressing. It’s easy, delicious, and perfect for any gathering. Every birthday party. Every quinceañera. Every gathering that involves half a dozen Mexicans and a good mariachi, you will find Ensalada de Pollo. 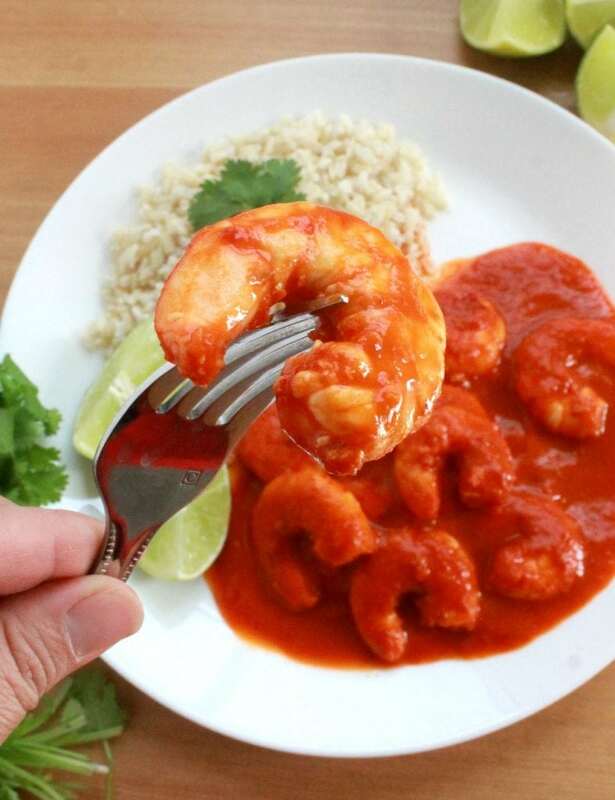 It is guaranteed to be a crowd pleaser and comes together in a snap. A little kitchen magic at your fingertips. What is not to love about that! This salad is a great way to use up what you already have in the fridge. You will need leftover chicken. You can also use a rotisserie chicken but remove the skin. Then chop it up into tiny pieces or shred it. Whatever method you prefer. Seriously, I can’t tell you how much I love this recipe. It is the BEST dish to take to potlucks. From here, the Ensalada de Pollo varies. 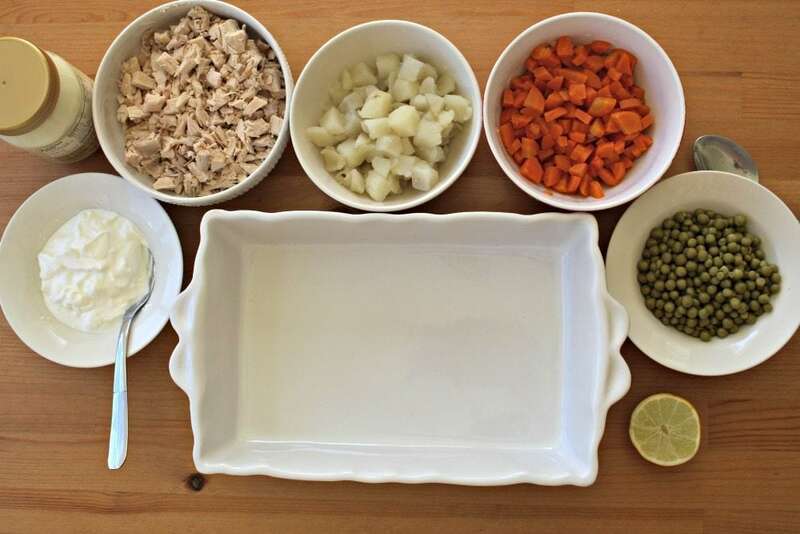 You can add peas, carrots, green beans, potato, or corn. You can add a few of these ingredients or all of them, then combine. 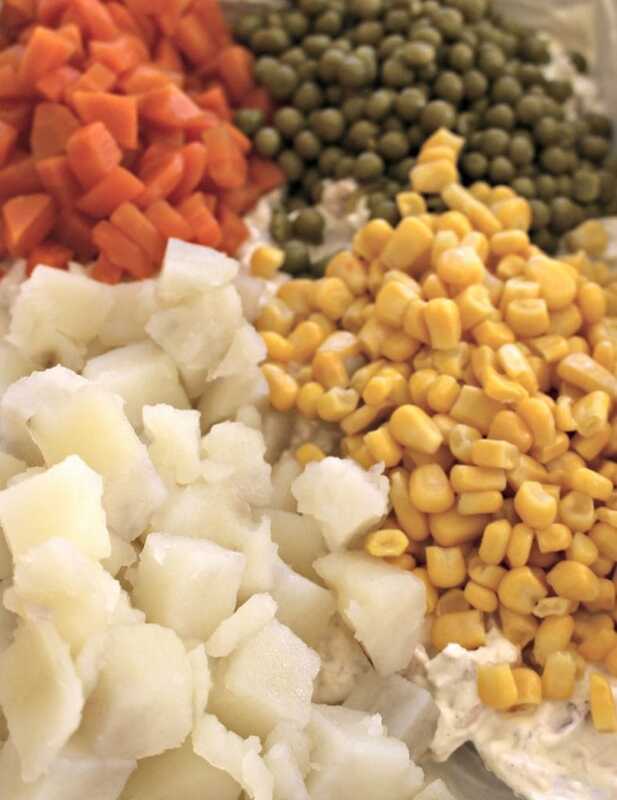 You can use canned corn , canned peas and carrots , canned green beans , canned diced potatoes . Or, you can use the fresh kind. Again, it depends on you, your imagination and what you have hanging out in your kitchen. 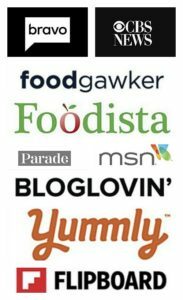 I have even seen people add pickled cauliflower and pickled carrots in the Ensalada de Pollo. It was very tasty! This recipe is very forgiving and very adaptable. 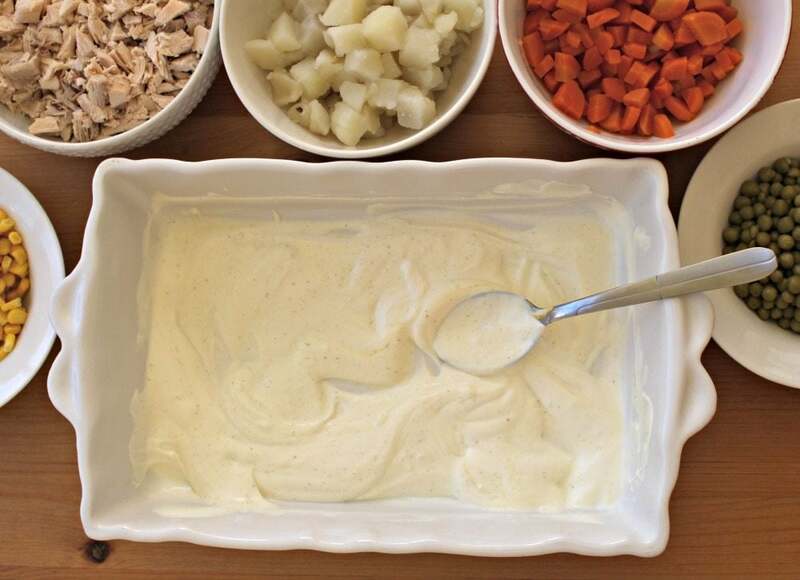 The dressing is very simple: sour cream, mayonnaise , lemon, and yellow mustard . You can add as much sour cream or mayo as you like. 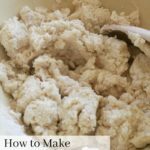 I personally like to do equal parts sour cream and mayo, but if you are not a mayo fan, you can also use more sour cream, or swap it out for crema mexicana or plain yogurt. How Long Can Ensalada de Pollo Last without Refrigeration? I’ve been to parties in Mexico where things were left out for hours… Please don’t do that. If it has been out at room temperature for more than two hours, don’t eat it. You can get sick. If it has been a hot day (we’re talking 90 degrees F and up), you should only let it out for 1 hour. You really want to dress the chicken (not for a red carpet appearance). 🙂 So, start by mixing the chicken and the dressing first. I like the chicken to be fully coated with the dressing. That is why I do this first. You can use chicken breast, chicken legs, chicken thighs. Whatever part of the chicken you have is good to use. The other thing: please notice the container. I am not transferring to a fancy container for serving. This is literally the bowl that I took to my potluck party. Then add your veggies and mix well. My gringo husband said Ensalada de Pollo reminded him of his grandmother’s cooking, and potlucks where little old ladies meet to play bridge, gossip and drink urns full of coffee. 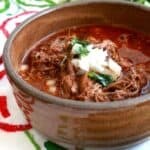 His comment made me look up the history of this “traditional” Mexican recipe. It turns out to be American! Say what?!! Yup! We adopted it from our amigos in the north. 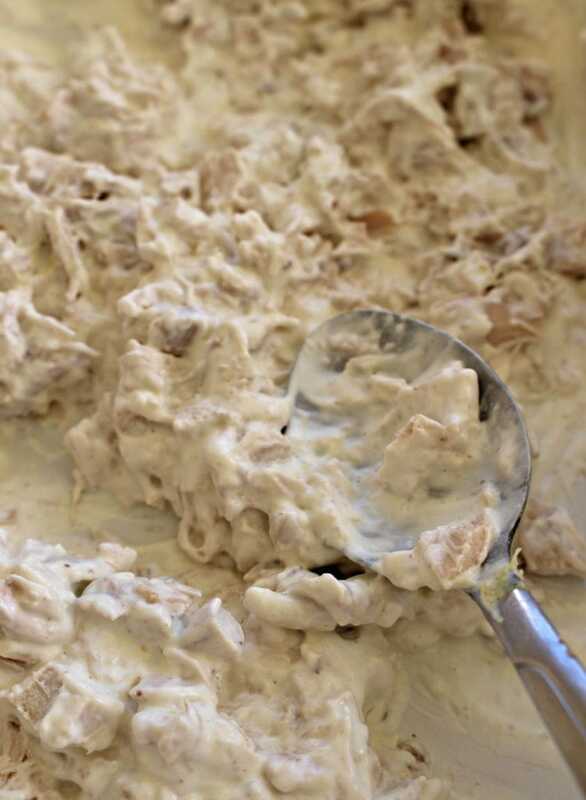 The chicken salad using homemade mayonnaise was published in 1847. It can be found in the 19th-century Southern cookbooks, The Carolina Housewife: Or, House and Home. First noted author was someone named Sarah Rutledge. Well, every culture takes a dish or two from other cultures and make them their own. That’s the same situation here. Somehow, we heard about it in Mexico and have been making it ever since. 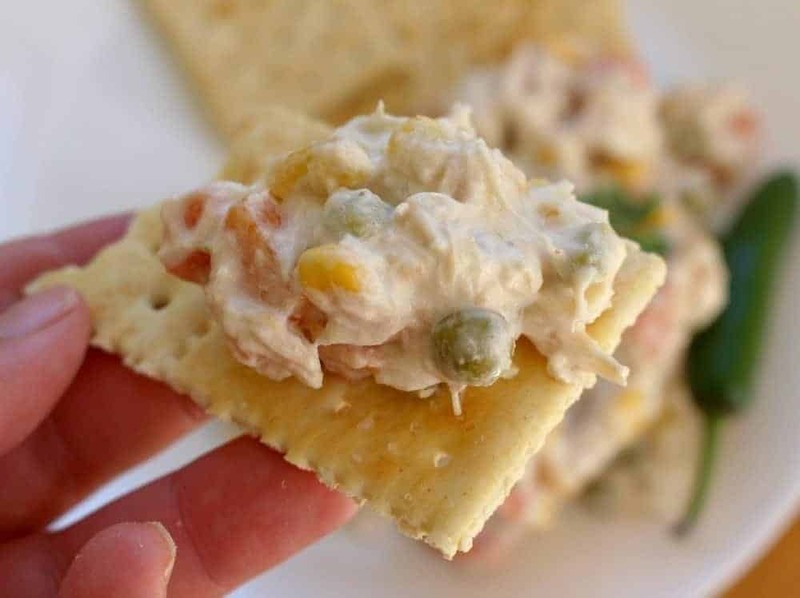 Serve your Ensalada de Pollo along with plenty of saltine crackers , on top of a crunchy tostada , or a leaf of lettuce. You also can’t forget a few pickled jalapeño slices. Something about that brine and spice that is sooooo yummy. It’s a perfect topping for the Ensalada de Pollo. Some people will even put them or the jalapeño juice from the container into the dressing itself. 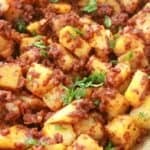 If you are serving this dish to a large crowd, you do NOT know who doesn’t like spicy food… best to leave it as a topping for people to add on their own as I have here with this recipe. In a container, add the mayonnaise, sour cream, mustard, lemon, salt. Then add the remaining ingredients and mix until well combined. 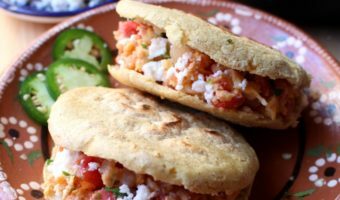 Serve along with saltine cracker, tostada, or lettuce and top with jalapeños. 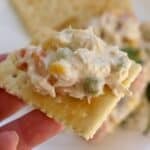 Love this recipe; it’s the reason I keep canned veggies on hand, usually prefer fresh or frozen. I make it with tuna for my husband, but next time I will try chicken! Yes! Definitely agree. With chicken, it’s great. Hope you like it. I’m so glad I was able to find this recipe! I work at a high school and last night our students put on a Festival of Nations to represent all of the cultures and nationalities that make up our student body. The table representing Mexico served this with homemade tortillas and it was seriously the best thing I tasted all night. I cannot wait to make it at home!